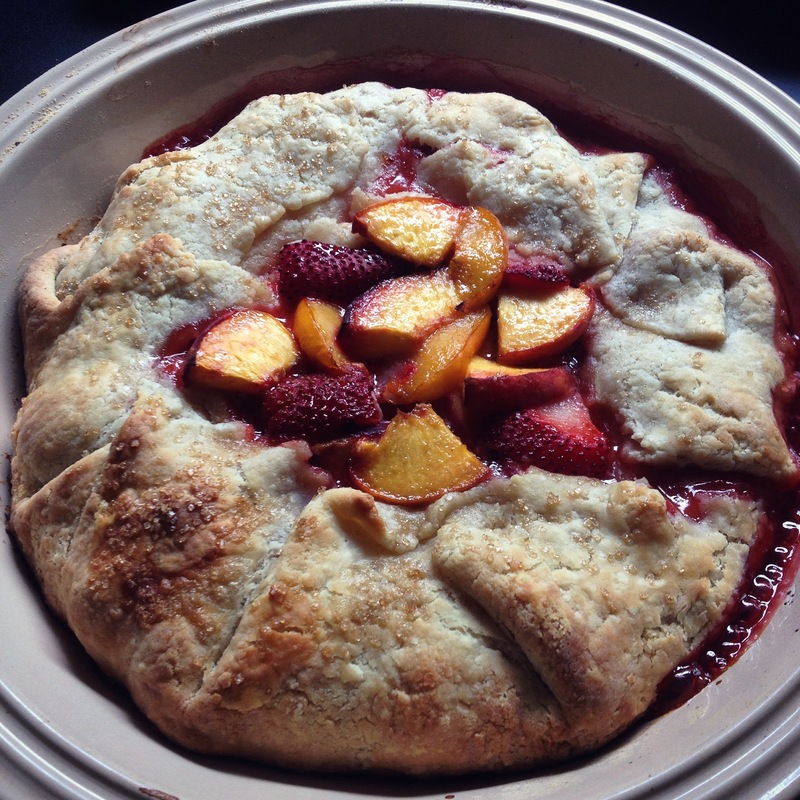 “Sunrise” galette, with peaches & strawberries. I used to think of strawberries as a spring fruit, peaches as a late summer fruit, and never the two shall meet. Thank goodness for everbearing varieties which give us another strawberry crop later in the summer! They allowed me to make this lovely galette. I couldn’t help but be reminded of sunrise when I was mixing up the fruit filling: yellow from the nectarcots, a range of shades of orange from the peaches, red from the strawberries. It looked like the sky on a “sailors take warning” summer day. The best thing about galettes is the ease of putting one together. If you need a quick dessert or a way to finish up a few cups of ripe fruit, it’s a great option. Use your favorite pie crust here; for me, that means the classic crust from First Prize Pies, though I’d like to try this cream cheese crust someday soon. I think it would be incredible with strawberries and peaches. Remember that most recipes make enough for a double-crust pie, so plan to halve the recipe, freeze the other crust– or make two galettes! In the filling, I borrowed one of the best tricks I learned from Four & Twenty Blackbirds Pie Book and added bitters to the fruit. Though optional, it’s a way to balance the tart fruit and sugary sweetness and just give your galette a little something extra. I used rhubarb bitters; you use any you have on hand or what sounds good to you. Similarly, I had a handful or perfectly ripe nectarcots to use but know they can be a difficult fruit to find; replace them easily with yellow plums, apricots or extra peaches. Just think: a little bit of slicing, a few crimps of crust and a half hour in the oven is all that stands between you and an edible sunrise. Preheat the oven to 425 degrees. I like to use a 10″ pie plate; it prevents all the delicious juices from running out and burning, and preserves the shape of even the juiciest of galettes. If you don’t have a plate that large, or plan to remove the galette to a platter to serve, you can also use a parchment-lined baking sheet. Roll out your crust to at least a 12″ circle and make sure it is evenly thick. Circular is helpful but not vital; this is a rustic dessert. Set aside about 12 pieces of beautiful fruit for the top. Combine the rest of the fruit in a large bowl with the lemon juice and bitters, if using. Whisk together the sugar, flour and kosher salt and sprinkle it over the bowl of fruit; toss gently until you can no longer see dry flour. Pour your filling into the prepared crust, leaving a 1″ (or slightly larger) border around the edges. Fold the crust in over the filling, making sure that overlapping pieces are not too thick; ruffled folds are beautiful, but consistency is key. Leave a circle of visible fruit in the center. Brush the crust with whole milk to promote even browning. Arrange the reserved pieces of fruit in the center space; dust the entire galette with demerrara or raw sugar for a little sparkle, if you like. Bake the galette for 25-30 mins., until the crust is golden brown. Remove and cool for at least 15 mins. before serving. Leftovers can be kept covered at room temperature for a day or so, or refrigerated for up to three– but it’s always best the day you bake it. *If your fruit is especially tart, you can go up to 1/2 c. sugar. I like some pucker in my filling, which is what I get when I use the 1/3 c. called for in the recipe. Alternately, if you have the sweetest fruit of the year, 1/4 c. sugar may suffice.